In a large pot fitted with a steamer basket*, bring several quarts of water to a rolling boil. Reduce the heat to medium-high, and add the squash to the steamer; two minutes later, stir in the leek. Season these with salt. Put the pasta on to boil in the bottom pot, cooking per the label's instructions. As soon as the squash becomes just tender, remove them and the leeks to a bowl. Set aside. Drain the pasta when al dente, and set aside. Return the pot to the stove. 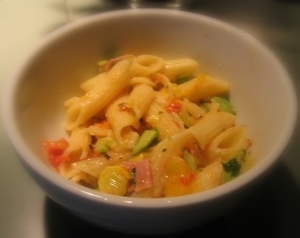 Add olive oil and speck to the pasta pot, cooking for a few minutes, until the edges of the ham start to color. Add the garlic to the pot, cooking for 2 minutes. Stir in the tomatoes, cooking for another minute. Add the pasta, squash/leek mix, and basil to the pot, stirring to coat and incorporate all the ingredients. Top with Parmeggiano to taste; serve with a salad or garlic bread.